The app 'Uber' is launched in a smart phone on July 1, 2014 in Barcelona, Spain. Some are challenging whether car-sharing services like Uber should be regulated at the airport. Taxi drivers have to wait in Reagan National Airport’s transportation service queue to pick up customers, but Uber does not have any contract with the airport that requires its drivers to wait in line for customers. At Roaches Run off of the George Washington Memorial Parkway, Uber drivers wait for travelers to request a pickup, News4's Adam Tuss reported. Customers who have taken Uber to the airport said the service is more convenient than other options. “He showed up two minutes after I plugged in the app, and we got on the road,” one Uber customer said. The Metropolitan Washington Airports Authority said pre-arranged pickups are legal at Reagan and Dulles International Airport. Uber fits under that category, the airports authority said. Airport officials are looking into how they can better regulate transportation services. 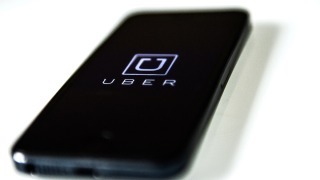 Uber spokesperson Taylor Bennett said the company is willing to work with administrators. "We know that Uber can help administrators tackle long taxi queues and we welcome the opportunity to work together," Bennett said.